There are few summer salads I enjoy as much as one made with chunks of cool, crunchy, sweet watermelon and salty, briny feta, punctuated with leaves of fresh mint from the garden. It’s as easy as salads get, and looks amazing on a shallow platter on the table. 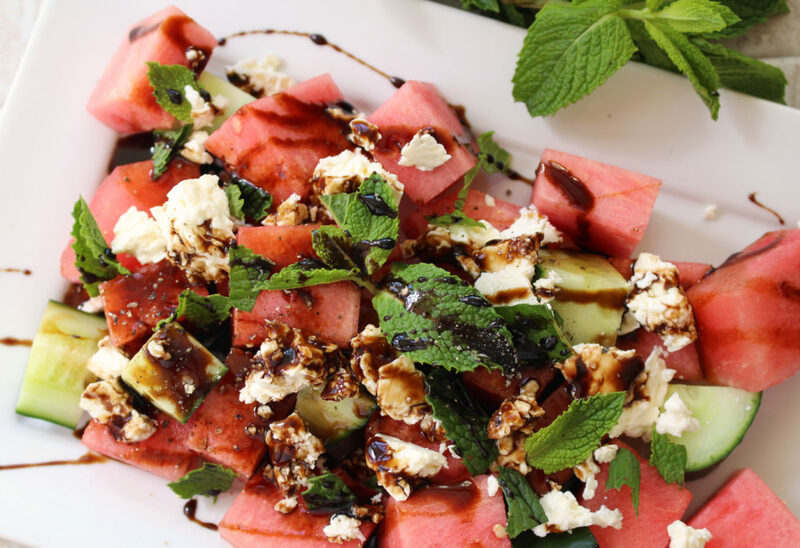 Because watermelon has such a high water content, the salad is refreshing – and easy to get on your fork, unlike spring greens on a hot day. I like to drizzle mine with a balsamic reduction, which you can make yourself by simply reducing balsamic vinegar in a small saucepan until it reduces by about a half, or buy by the bottle at most grocery stores. It holds onto the watermelon and feta better, without getting runny like straight up vinegar can. If you’re concerned about the amount of sugar, artificial colours and flavours in typical frozen treats, here’s an easy way to make all-fruit popsicles to keep kids cool during the warm summer months. With its high water content, watermelon is perfect for pureeing and freezing in ice pop moulds – add a few whole berries to add an even bigger vitamin boost. How different is this?? A fresh, tasty coleslaw made out of white watermelon rinds! In addition to being environmentally friendly and economical (a great way to eliminate food waste), the rind is packed with citrulline and arginine, two compounds that aid in healthy blood flow! No one will guess what this crunchy salad is made out of. In case you haven’t tried it, finely chopped watermelon is a great addition to salsa – juicy, crunchy, slightly sweet; a refreshing contrast to the chilies, black beans, corn and spice. It tames the heat, and lightens it – it’s a great way to use up that enormous watermelon that might be taking up space in your fridge or on your kitchen counter. Serve it with tortilla chips or over grilled chicken or fish. It’s patio season – which means having some great nibbles in your repertoire that are easy to pull out and assemble without turning on the oven. 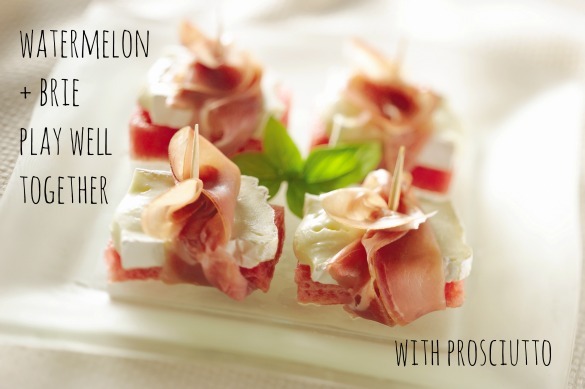 These little bundles of joy are similar to the prosciutto wrapped melon of the eighties – the addition of a chunk of creamy brie puts them over the top. Summer is (almost) here – depending on where you live – and watermelons are starting to fill up produce shelves. We love a good watermelon salad – that juicy, sweet crunch goes so well with so many other ingredients – it’s a great way to rehydrate and delivers a healthy dose of lycopene. Here’s a unique salad for this long weekend’s backyard barbecue – it’s sure to be popular all summer long!